He plays like an angel.. Excellent vector, it looks fantastic. You did such a great job. The piano is a bit messy in some places, but considering that you vectored this from screenshots makes up for it. Really nicely done! Simple and beautifull ! Great work ! Nice vector! But I think your background is a little bright.... with that solid gradient ..... and it is sooo violet too, maybe you should add more colors or fill it a bit. Great job! The vector work on Tamaki and the piano is nicely done. The bg work is simply amazing with the sakura tree in bloom, that alone is what drew my attention. Nice work with everything. I love the vector work on Tamaki. The fine lines are really beautiful! The background is a little bright, but overall this is really good! I love the colors you used. i just love your wallie! i wish i could fav it! but guyess my mt still does not love me buuuu love it! i can feel the gentleness of his song kyaaaaaaaaaaaaaa tamakiiii! daisuki! Wow, I love the sakura tree in the back, looks very pretty and delicate. 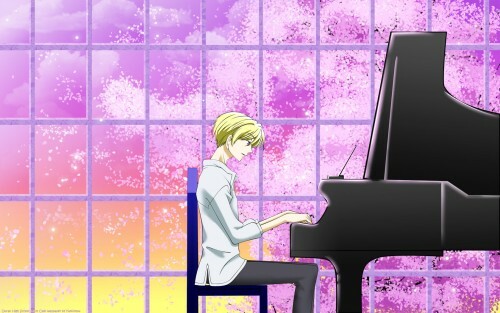 I adore Tamaki when he plays the piano, it shows the more gentle side to him. Lovely scene! Very good work! Thx! Wow! Did you make the background by yourself? If not, where did you get it? nice scan thanx for sharing ^^! I love the simplicity of this wall. Tamaki looks amazing in front of the cherry blossoms. Great job!